On April 25, 2009, Pop pioneer James Rosenquist returned to his Aripeka, Fla., studio to find that a brushfire had reduced to cinders everything from his mother's scrapbooks to art valued at $18 million. The fire's speed and indifference to the things he treasured left him wondering about the mark he'd leave on the world and whether he still had something to say. Mr. Rosenquist's answers can be seen in a show of new work that will open Monday at New York's Acquavella Galleries, called "Multiverse You Are, I Am." The 25-foot-long "The Geometry of Fire," which depicts bright orange flames flickering across a night sky punched with stars and metallic shards, anchors the show. "Sometimes there is no rhyme or reason to things, like my fire," he said. All the works in his show reconfigure images from deep space, with galaxies and supernovas colliding in fractured shapes that evoke kaleidoscopes or origami. As the only child of stunt pilots growing up in the plains of Grand Forks, N.D., Mr. Rosenquist said he was fascinated with flying and space and was determined to become an airline pilot. But after his pilot uncle died in a plane crash, he moved to New York to study at the Art Students League. By the mid-1960s, he was painting wall-size canvases of overlapping images of spaghetti, jet planes and JFK. The works were a hit. Mr. Rosenquist's well-known "F-111" shows a sleek jet threading its way through tires, bulbs, a toddler and a mushroom cloud. Lately, the artist has been thinking a lot about "F-111"—"I can't believe I did that painting 47 years ago"—and marveling at how quickly his own career seems to have flown by. 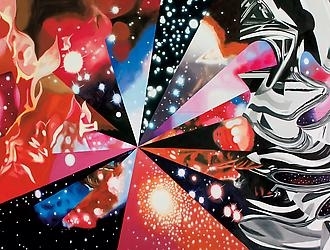 Grieving the recent loss of some art-world friends like critic Robert Hughes, Mr. Rosenquist said he's taken comfort in the wide range of colors that show up in telescopic images of outer space. "We may seem insignificantly small," he said, "but we exist. So I remain optimistic."